Mick Doyle played for Ireland and the British Lions as a flanker before going on to success as Ireland's coach. He was also a respected and hard-hitting journalist with the Evening Herald and the Sunday Independent and, in his full-time job as a vet, a leading expert on poultry diseases. 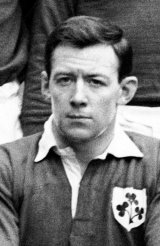 Doyle won 20 consecutive caps for Ireland and toured South Africa with the Lions in 1968, as well as winning a Blue for Cambridge University in 1965. He then moved into coaching and guided Leinster to inter-provincial championship honours for five years in succession (1979 and 1983). From there he went on to coach Ireland to a Triple Crown and Five Nations Championship success in 1985, his side popular for their running game which he encouraged. In New Zealand for the 1987 World Cup, he suffered a heart attack, returning to the bench before the tournament was over, and he had retired from his active role when struck down by a brain haemorrhage in 1996. He recovered from that and returned to journalism, only to be killed in a car crash in 2004. Doyle lived the game as hard as he played it and was renowned as a raconteur. His famous "give it a lash" mantra to his players summed up his own attitude to life.